The European exploration of Newfoundland and Labrador continued through the 18th and 19th centuries, often with the assistance of Native peoples. At first, attention concentrated on the coastlines. After the end of the Seven Years' War in 1763, as part of its reorganization of the administration of North America, the British government commissioned accurate surveys of the island of Newfoundland and the Strait of Belle Isle, which were carried out by James Cook and Michael Lane - while at the same time Joseph DesBarres surveyed Nova Scotia, and Samuel Holland, Prince Edward Island. The Labrador coast also came into sharper focus, but maps remained unsatisfactory until the 1860s at the earliest. 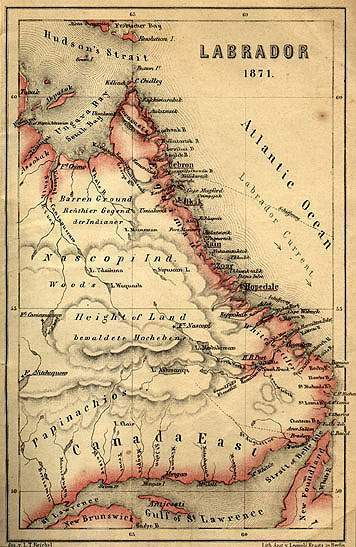 A considerable amount of information about northern Labrador was collected by Moravian missionaries, who between 1765 and 1812 explored the coast from modern Hopedale into Ungava Bay. The first mission station established on the Labrador coast was at Nain in 1771. From there the Moravians extended their activities both North and South, establishing mission stations at Okak in 1776, Hopedale in 1782, Hebron in 1830, Zoar in 1865, Ramah in 1871 and Makkovik in 1896. Map drawn by Bishop L.T. Reichel. Published by Leopold Kraatz, Berlin 1871. Reproduced courtesy of Dr. Hans Rollman, Department of Religious Studies, Memorial University of Newfoundland, St. John's, NL. The exploration of the Labrador interior was begun by French traders in the years before 1763. It was continued in the 1830s by employees of the Hudson's Bay Company, who established an overland route between Ungava and Hamilton Inlet. The Labrador interior also attracted adventurers from the United States, such as Leonidas Hubbard, but their contribution was far less significant than that of Albert P. Low, who explored and mapped much the interior during the 1890s for the Geological Survey of Canada. All these European travellers relied on the assistance of indigenous people, whether Inuit, Innu or the Southern Inuit of NunatuKavut, who had hunted and trapped over the interior for centuries. 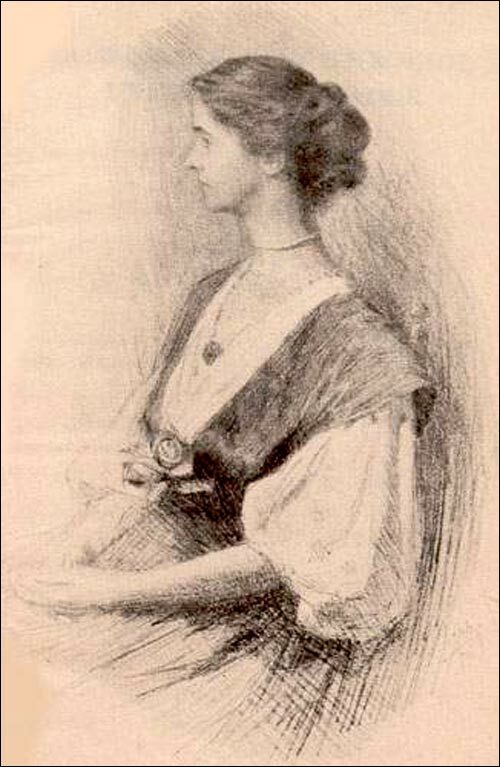 Mina Hubbard was the wife of Leonidas Hubbard the American adventurer who travelled to Labrador in 1903 in order to traverse the peninsula from North West River to Ungava Bay. Leonidas Hubbard died from starvation before completing his trek and his wife then traveled to Labrador in 1905 and completed the route herself. From Mrs. Leonidas Hubbard, junior. A Woman's Way through Unknown Labrador: an Account of the Exploration of the Nascaupee and George Rivers. London: J. Murray, 1908. Frontspiece. Because the island of Newfoundland was regarded as a fishery only, its interior was terra incognita to Europeans until the later 18th century, when Cook explored	the Humber River, and James Cartwright the Exploits and Red Indian Lake area. In 1822, William Cormack made the first known traverse of the island by a European. These were no more than initial probes. In due course the main features of the interior were established by geological surveyors, mainly after 1864, and to a lesser extent by surveyors laying out lines for telegraphs and railways. Alexander	Murray and James Howley of the Newfoundland Geological Survey made the most significant contributions to this process. Alexander Murray surveyed the main features of the island's interior. Courtesy of the National Archives of Canada, C-088097. By the early 20th century, both the Island and Labrador had been explored, and mapped with reasonable accuracy. Geological, cartographic and other surveys have continued ever since, building up an increasingly detailed portrait of the province. The major new exploration frontier has been offshore: the delineation of the seabed and its hydrocarbon potential, and the attempt to understand the biology of marine ecosystems. The designation Metis updated to Southern Inuit, May 2016.